When I said in the last post that I was planning a summer break, I meant from late July, not now! You still have me for a while yet! We have a little ritual in our house, after boring stuff like cereal hoops during the week, Saturdays are boiled eggs and Sundays are bacon sandwiches. 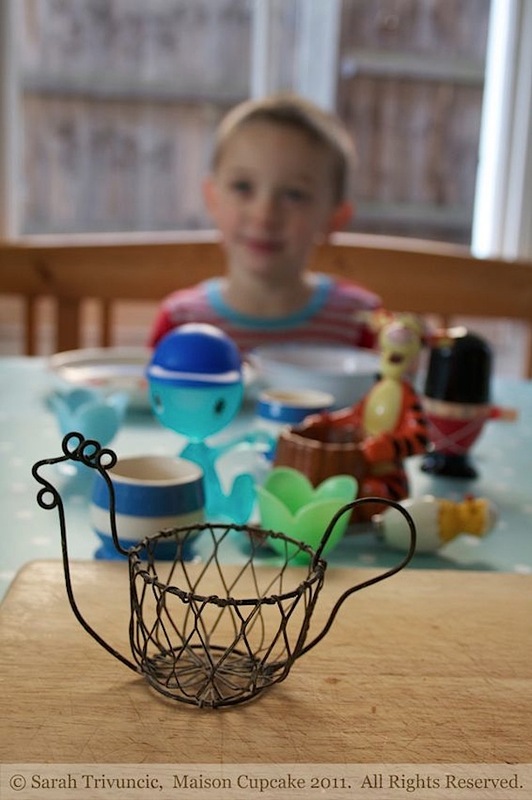 Ted has quite a collection of egg cups as you can see above and each time dippy eggs are on the menu, Ted gets to choose his egg cup of the day. 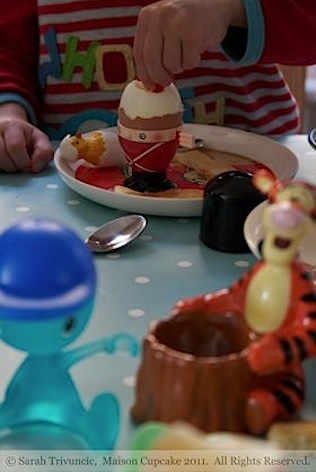 We have stripey Cornish egg cup (sadly unappreciated), plastic Alessi man with little hat for salt and ceramic Tigger amongst others. Also we have groovy spoons with chickens bursting out of eggs on the ends. 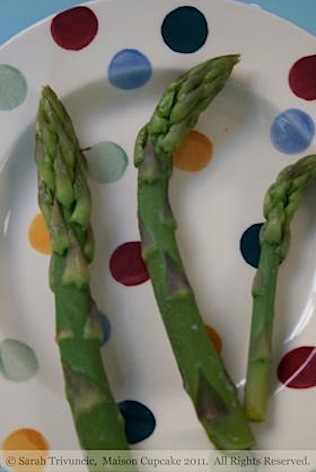 Since asparagus is in season, I decided to introduce Ted to asparagus spears in dippy egg, it was predictably met with his usual response to vegetables other than brocolli, tomatoes or mushrooms: “that is yuck”. Oh well, I tried. You can also see here a slice of bread from my new bread maker which I will be reviewing tomorrow. 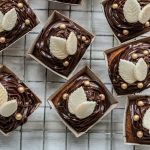 I am submitting today’s post to two blog events of dear friends…. I hope they both forgive me for the lack of cooking involved! 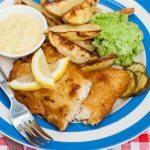 The first is Ren’s great new monthly event Simple and Seasonal at Fabulicious Food in which she’s inviting everyone to submit seasonal recipes they have blogged during the previous month. It really is a case of the simplest ideas being the best, I have every expectation this is going to be one of those blog events that takes off. 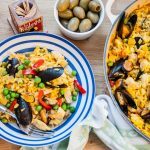 If you’ve blogged a recipe using a seasonal ingredient this month, why not submit it too? You have until the last day of each month to do so. The second is Breakfast Club, organised by Helly at Fuss Free Flavours but hosted this month by Johanna at Green Gourmet Giraffe with the theme “savoury vegetarian breakfast”. Finally, I must give a special excited mention to my friend Vanessa Kimbell who sent Ted this wonderful soldier egg cup below for his collection. 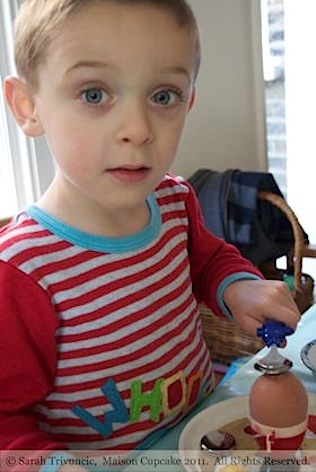 Ted loves it and even if he’s selected a different egg cup he is using the little red spoon every Saturday! My copy of Vanessa’s new book Prepped! arrived in the post today and I can’t wait to start cooking from it. 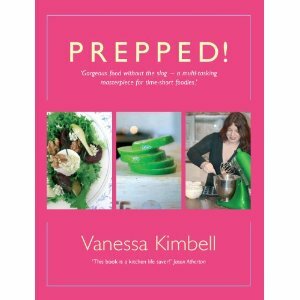 I will be blogging the two recipes I tested for Vanessa during the writing of Prepped! as well as publishing my review the week after next. 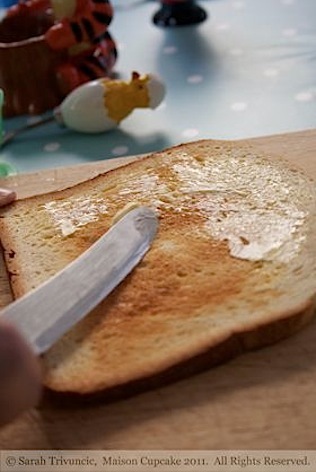 In the meantime though… do you have any weekend breakfast rituals in your house? If Ted does not like asparagus then that means more for you! Thanks for taking part in breakfast club. 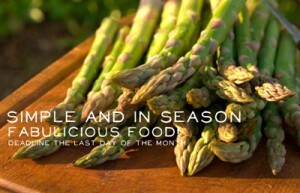 Lovely – love asparagus. 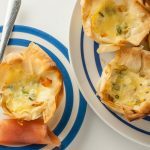 Great idea about multiple egg cups. My little one is just starting to get into the whole boiled egg thing. I too am tired of cheerios for her breakfast! So cute! I’m sure it makes breakfast so much more fun. We’re a cereal during the week and pancakes on the weekend kind of family. These are to cute! I love the Tigger one. 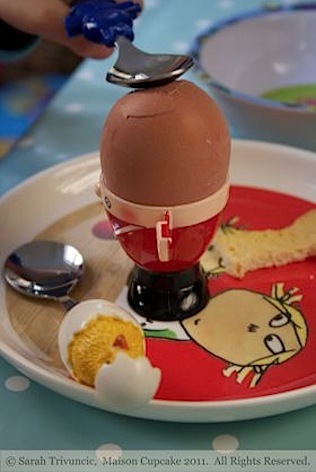 I wonder if this could be a way to get my little one to eat eggs. He is so picky. lol We tend to have pop tarts and jelly toast during the week if he is in school. But on the weekends he occasionally will eat french toast and sausage. Great post! This is so cute! It probably makes breakfast time so much more fun. I really need t try this with my little one. He’s a very picky eater and doesn’t eat eggs at all. Maybe being more creative will help lol. We do toast and pop-tarts during the week and sometimes french toast and sausage during the week. Great Post by the way! Lovely pics and Ted is a cutie! Well you have grand breakfasts! Eggs and Asparagus are supper dishes here! I hated vegetables when I was younger, and only ate broccoli, long beans, carrots and beansprouts. Now I love all vegetables… funny how age changes you. Or in my case, I think it was being away from home and having to cook for myself! 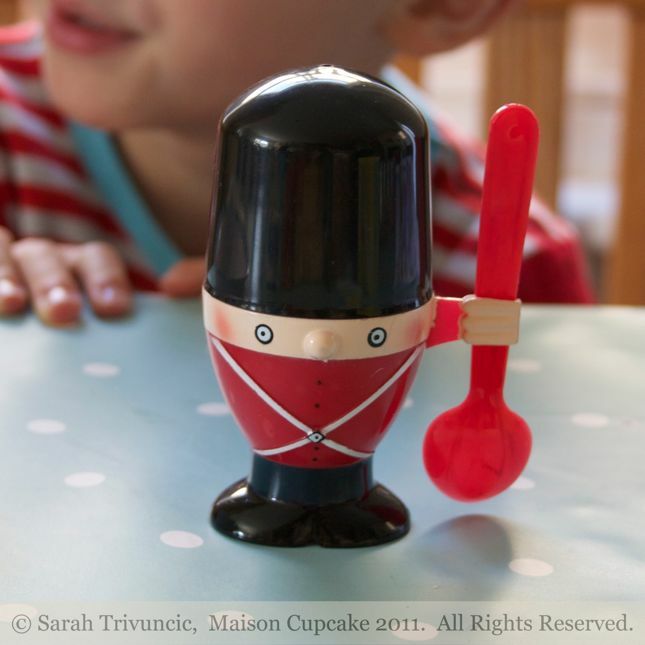 I love the little soldiers – I nearly bought the little kit for doing that – so cute! 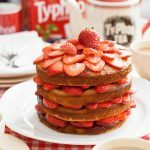 I love that treacle bacon! We have it too! 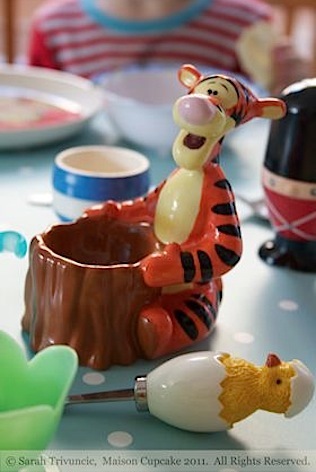 I adore your egg cup collection – how great are they!!! 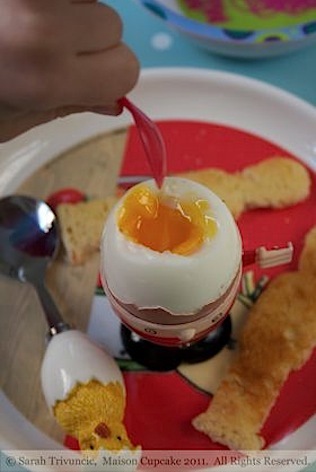 I would want dippy eggs for breakfast every morning if I had them. 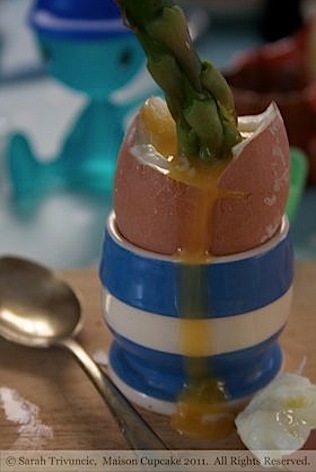 Nothing can beat dipping asparagus into golden runny eggs. Yum! Thanks! My husband is the dippy eggs-pert. I make them too hard or too raw. He has it down to fine art. Not making a decision about what to have for breakfast during the week is my ritual. 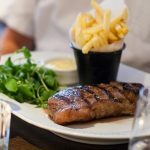 I get into a rut of eating one thing for ages (e.g. porridge)then switch to something else. 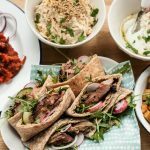 Weekends are different and we either go out on a Friday (our weekend here in the Middle East) – eggs benedict or shakshouka are top of the list – or have a cooked breakfast at home. Bacon sandwiches are often on the menu. 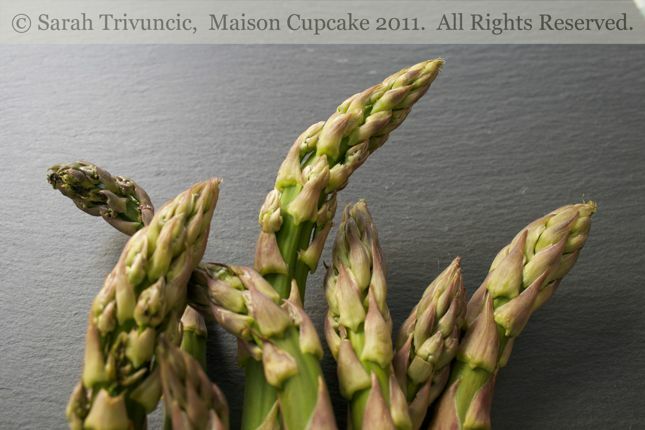 Keep persevering with the asparagus – I have one daughter who loves it the other (vegetarian) hates it. 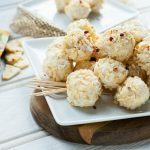 That’s funny – I’ve been meaning to make egg & asparagus dippers for a while now, possibly with smoked salmon or prosciutto involved too! You have galvanised my resolve. No breakfast rituals really, other than weekends are the only time I drink coffee with breakfast!